There were two principal sources of crests for the Victorian collector. The main one was from correspondence - collecting crests from envelopes and notepaper. When your correspondents did not run to crested stationery sets of crests could be purchased from a handful of firms who produced specifically for the collector, and few albums do not have at least one set among their pages. There was a third, much smaller, but interesting source of crests. Stationers issued sample crests with the utilitarian purpose of enabling prospective clients to choose a particular design, style or colour for stamping their personalised stationery. It is not known when this practice came into being. It was being followed in 1871 when Ortner & Houle issued a sheet of 15 crests incorporating their business details, on paper watermarked Joynson 1871. Specimen of die engraving and colour stamping from Acton Griffith, 8 Baker Street, Portman Square, W.
Acton Griffith was at 8 Baker Street from 1856 to 1881. He is noted as a bookseller and stationer in 1864 but as a stationer and engraver in 1874. These details would suggest that this sample sheet dates from the 1870s. Henry Rodrigues of Piccadilly, London was advertising in the Illustrated London News in 1850: Arms, crest and coronets etc or initials stamped on paper and envelopes in the most elegant style. This probably related only to blind stamping. However, they did produce a specimen sheet at a later date, an example of which is in the collection of the Bodleian Library, Oxford, which records: Arms, coronet, crest, or monograms, stamped on paper and envelopes, in gold, silver and colors, and Rodrigues' monograms and heraldic devices, designed and engraved as gems of art. The Bodleian also has a number of sheets of crests issued by Spiers & Son of Oxford which, from the wording on them, appear to be specimens though they include the individuals' names under the various crests and monograms which suggests they may also have been sold to collectors. These stationers' samples were very ephemeral; the client made a choice and disposed of the material. Most would be destroyed, some were passed to youthful collectors to be cut out of the sheet and added to their collection, whilst others were filed away and are still to be found among family papers. The handsome and large (22.8cm x 18.7cm) sheet from Ortner & Houle was pasted in the front of a photograph album and luckily survived the destruction of the unwanted album. Sheets of sample crests are interesting in giving some indication of those who could offer crested stationery and in showing the styles which were in fashion at different periods. The individual crests were often numbered allowing orders to be placed by quoting a particular reference, and crests with their reference still attached are occasionally encountered in albums. Samples for colour were also produced. The collection does not have any examples in their original format but it seems fairly clear that pages of the same crests in a variety of colours found in two albums were from sample sheets. Above is a section of a page featuring 22 crests of the Royal North Lincoln Militia, all in different shades. 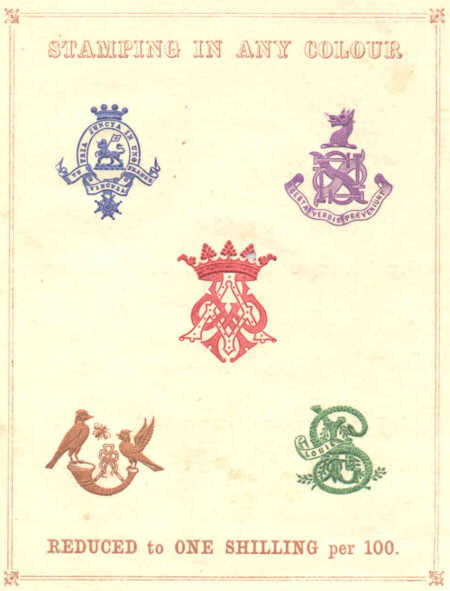 Below are some of the 18 crests over the name Oakfield, also in a variety of colours, including 11 'metallic' colours, found in an early twentieth-century Lincoln album. By the end of the nineteenth century some of the samples were being issued in booklets and served not only as examples of crests and other stamped material, but for the colour and quality of the stationery, and even of the width of the black edges of mourning stationery. The head and foot of one of twentynine pages in a booklet of samples issued by the Civil Service Co-operative Society Ltd., giving comprehensive details of cost of dies, paper and envelopes. Samples were printed on the various writing papers so that the customer might judge their relative qualities. The samples took the form largely of small sheets showing examples of a few crests. The greatest part of the cost of this was in the production of the dies, and some at least of the samples would be those which had been produced for clients. The dies were a charge to the client and theoretically their property though they would normally be held by the stationer for executing repeat orders: changes of address, marriage and death would all render dies obsolete allowing them to be added to the pool of sample dies. Since the foregoing was written two further types of samples have been noted. An early stationer's sample book from America is particularly interesting. Originating in the Boston area it is thought that it was put together in the 1860s or early 1870s as it contains watermarked paper of 1866 and 1869. Actual stationery, all engraved, is laid down on plain pages. It would be used to choose type of paper, style of envelope and type of engraving. The other sample probably dates from the same period. It comprises a single folded sheet printed by Hopkins & Co., wholesale manufacturing stationers of Houndsditch, London, which gives details of prices for stamping envelopes and notepaper. Twenty actual examples of the monograms which they were offering were laid onto the sheet as samples of colour and style. Mint sample sheets are still coming out of India and it may be that old plates are being utilised, or the material may be coming from a stock of original sheets. A section of a sheet from the State Crested Work in Allahabad is shown below, and another sheet from the same factory is illustrated on my India page. Hopkins & Co., 42-44 & 117 Houndsditch, London. Hugh Imlay, Aberdeen, Scotland, engraver, die cutter & embosser. J H Kenward, 4 Chapel Street, Edgware Road, London, importer, exporter and manufacturer. Edward Matthews, 377 Oxford Street, London, designer and heraldic engraver. G E Oliver, Edinburgh, Scotland, engraver & die sinker. W G Todman & Co., London. Joseph Town & Sons Ltd., Albion Street, Leeds. Civil Service Co-operative Society Ltd., London. Thomas de la Rue & Co.
T E Co. Ltd., Birmingham. Guard Bridge Paper Co. Ltd., Fife, Scotland. 1950s sample book of Eden Grove Bond papers, with a good assortment of die-stamped or thermographed letterheads.